Communication is a crucial part of any project, and especially one as significant as cleaning up an ecosystem that has been deemed an Area of Concern. One of those AOCs is the Sheboygan River, and Illinois-Indiana Sea Grant Environmental Social Scientist Caitie McCoy has been very involved in the remediation project, working with and reaching out to the communities that live near and rely on the river in a variety of ways. To better understand community views and concerns about the river and the river cleanups going on this summer, several interviews were conducted with local stakeholders. 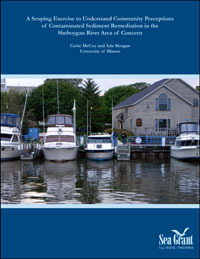 The findings and resulting recommendations are presented in a qualitative study put together by Caitie and Ada Morgan, entitled “A Scoping Exercise to Understand Community Perceptions of Contaminated Sediment Remediation in the Sheboygan River Area of Concern.” You can download and read the entire study here. The Sheboygan AOC cleanup, and the work that Caitie and others have done to involve and inform communities, is possible because of the Great Lakes Restoration Initiative, the Great Lakes Legacy Act, and Illinois-Indiana Sea Grant.